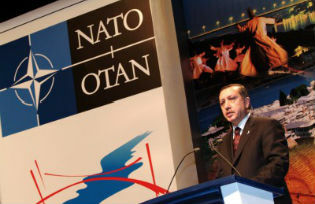 Relations between NATO and Turkey appear to be at a crossroads. Never before as in recent months have so many critical voices been raised against Turkey, with some analysts and experts even suggesting the possibility that Ankara may be expelled by the Atlantic Alliance. The reasons are well known: on the one hand, Turkey is accused of having supported, at least indirectly, the so-called Islamic State (or Daesh) in the north of Syria, especially for anti-Kurdish reasons, threatening to undermine all western efforts, which have relied on Kurd fighters as allies on the ground against the Daesh. On the other side, in November of 2015 Turkey risked dragging NATO into a broader confrontation with Russia because of the downing of a Russian jet that had violated Turkish airspace. Furthermore, if we look at the internal scenario, Turkey seems to have entered a phase of new authoritarianism, made evident by the climate of repression and censorship against the media. Why does Turkey seem so distant from western allies and how can Turkish foreign policy align again with the NATO interests? Turkey, a NATO member since 1952, has the second biggest army within it. In the era of the bipolar world, it was definitely easier than today to frame the interests and behaviors of international actors. The world was much more “static”, international relations were based on belonging to one or another camp and the two poles were well defined. In this context, Turkey has always played an important role as a bulwark of western defence against the Soviet Union. The military has historically been the nucleus around which the country’s institutions have evolved and Turkey served as a deterrent to Moscow. The major threats to its security were constituted by the presence of the Soviet Union at its borders and of USSR satellites in the area (especially Syria, known as the “Cuba of the Middle East”). In addition, from the 1970’s onwards, a major threat was the presence of extreme leftist groups and most of all, the Kurdish organization PKK, which in 1984 started an actual armed struggle against the Turkish state. In this context, for decades the Middle East held little interest for Turkey. Everything changed with the fall of the Berlin Wall and the dissolution of the Soviet Union, after which the world’s balancing acts have become more fragile. Meanwhile, in the late eighties and early nineties, a number of internal changes occurred in Turkey (beginning its process of democratization), which gave a new political and economic direction to the country. In this context, Ankara has become interested again in the Middle East. It began to open up to old enemies, such as Iran and Syria (even Russia itself), with the aim of creating an environment more feasible to an exchange of relations that, at once, could encourage Turkey to grow and make it a new pivotal actor in the Middle East. With the rise to power of Erdogan and AKP in the early 2000s, this policy was increasingly evident and Turkish foreign policy has become multidirectional and directed to the Middle East, Eastern Europe, Central Asia, Caucasus and Africa. Here were the roots of the so-called policy of “zero problems with the neighbors” inspired by Erdogan’s foreign policy adviser of the time, Ahmet Davutoglu. For a decade, we heard about a supposed Turkish model for the Middle East, but the situation changed again with the outbreak of civil war in Syria. To better understand how Ankara is reacting to the evolving area, we need to understand the strategic priorities of Turkey and the perception that Turkey has regarding its position in the Middle East and the threats to its security. The main threat Turkey sees to its security and national interest is embodied in the so-called Kurdish question. Next to this perceived threat, during the last twenty-five years Turkey has tried to limit as much as possible the negative effects of the crises on its borders, first of all in Iraq. The civil war in Syria, with Erdogan sided strongly against Assad, represents another crisis that can potentially destabilize the country (it involves the Kurdish issue, the refugees issue and cross-border terrorism). Therefore, at this time, the Kurdish question and the civil war in Syria (two issues that are becoming indelibly connected) are seen as the largest drivers of instability for Turkey. In addition, the advance of Islamic State and the infiltration of Daesh right across the borders of Turkey have undermined Turkey’s stability. The evolution of Daesh itself is illustrative of how Turkish politics have been ambiguous since 2011. Initially Turkey tolerated Daesh activities in order to fight Bashar al-Assad, but now Daesh has become too influential and even Ankara has understood that it must be combated. On the one hand, Turkey could not continue, if it wanted good relations with the west, turning a blind eye towards the advance of the Islamic State. On the other hand, it actually had to react when it was directly hit by terrorist attacks in 2015. However, if we come back to the analysis of what I call the main Turkish security obsession, namely Kurdistan, it is easy to deduce Ankara’s dilemma in the current Syrian-Iraqi context. Turkey is caught between two fires: on the one hand, fighting Daesh siding with its historical transatlantic allies. On the other hand, preventing the Kurds from acquiring any kind of tactical or strategic advantage in the area. Since the Syrian Kurd party PYD, a sort of Syrian branch of the PKK, is among the foremost western allies in the fight against the so-called Caliphate, the zero-sum game that results means that fighting Daesh can indirectly benefit the Kurds. For this reason, Ankara has again escalated its confrontation with the Kurds and has reignited the fires of war in its southeastern regions. With the pretext of fighting Daesh, it also hits the Kurds in Syria and Iraq. Moreover, Prime Minister Davutoglu did not hesitate to compare Islamic State to the PKK, making it clear that for Turkey the Kurdish issue represents the highest priority. In doing so, Erdogan also temporarily realigned his country to the positions of the nationalists and of the army, which effectively he had ousted from power circles during ten years of political and judicial campaigns. However, what kind of strategy is it? In fact, this seems to be more like a short-term solution than a structured strategy. But on the contrary, in order to have stable borders and eradicate the threats to its security, Ankara needs a long-term strategy and needs to secure its allies. Turkey is currently experiencing the paradox of being integrated into the western security and defense system, while not sharing some of the most basic western objectives. In addition, if it’s true that NATO is not only a community for shared security, but also for shared values based on a common commitment to democracy, Turkey could also feel under pressure for its controversial authoritarianism. We could draw a parallel with what has happened in Turkey’s relations with the EU, at a time when Ankara, having been admitted as a candidate for full access, has nevertheless always suffered discriminatory treatment at its hands. However, in that case, Turkey was trying to comply with the EU standards when the latter closed its door to Ankara. In response, Turkey has tried to demonstrate that it could survive perfectly well without joining the EU. With this goal in mind, it has expanded its relationships to other (Eastern) theatres. NATO, however, is not the EU. What alternative does Turkey have in terms of military alliance and security? Last month, Saudi King Salman went to Ankara to visit Erdogan and the two discussed the creation of a sort of NATO-style alliance of Islamic, actually Sunni, countries. However, this kind of project implies an inevitable Ankara rapprochement with Egypt, with whom relations are very cold because of the support given by Erdogan to the Muslim Brotherhood. Above all, it would be impossible to imagine such a coalition without the consent – and the direct support – of the United States. This means that such a possibility cannot be an alternative to NATO membership for Turkey, and explains why for Turkey NATO membership is hardly in question. Finally, the latest developments in the relationship between the EU and Turkey seem to suggest that Ankara has a new relevant partner on the western side, represented by Germany. Does it mean that the strategic axis once based on the special relationship between Turkey and the US could now be replaced by relations between Berlin and Ankara? To be clear, Turkish-German bilateral relations respond more to a contingent need of the EU, in the face of the migration emergency, than to an effective new realignment. Despite the differences within NATO, Turkey and the US will continue to cooperate. In the Turkish vision, the key for stability in the Middle East would be the defeat of Assad and the establishment of a friendly new government in Syria. At the same time, this objective should be reached without giving the Kurds any possibility to claim an independent state, or any sort of further autonomy. Beyond current positions, the US too do not seem to support the creation of an independent Kurdistan. Both the US and Turkey agree on the necessity of fighting Islamic State. Against this background, the future balances of the region, with Russia and Iran trying to maintain their influence in Syria and the Sunni axis trying to counter-balance these efforts, are the most important issue to be resolved. Nevertheless, the most worrisome issue for the Turkish government is still the internal Kurdish question. Western efforts should be concentrated once again on bringing Turkey and its Kurdish community to the negotiating table. Turkey needs reassurances that Kurdish claims will not be backed by its western allies. However, at the same time Ankara has to turn down the escalation against its Kurdish communities and it has to give up on censorship against civil society. Stefano M. Torelli is Research Fellow at the Italian Institute for International Political Studies (ISPI). His research topics include Middle Eastern studies, Political Islam and International Relations and he has worked extensively on Turkey and Tunisia. Torelli is currently Adjunct Professor of History and Institutions of the Middle East at the University IULM in Milan and has been a consultant for the Italian Parliament.